Thanksgiving is just a few days away. Are you ready? One of the many recipes I’ll be making is the Armenian Stuffing recipe mentioned here. One of my readers, Ara Kassabian, was kind enough to share his family’s version of Armenian stuffing. It sounds most delicious with the combination of spices, nuts, meat, and rice. Similar recipe: When you buy the chicken, make sure it comes with the giblets, liver, etc. Also take a little bit of lamb or beef. Cut everything into small dice (about 1/2 inch) and season with salt, black pepper, allspice, cinnamon, and clove ("baharat"). Heat butter in a small frying pan and fry some slivered almonds, pine nuts, boiled chestnuts, peeled pistachios... Remove the nuts and add the meat. After it is browned, add water and cook. 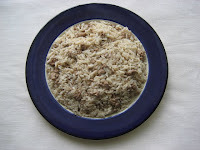 Make the rice separately, again adding the baharat. Mix the two and stuff the chicken. In "ghoozoo ichi," you do the same thing but keep the meat in large, flat slices. I think you can also add dried apricots, raisins, a little sugar. The mixture then goes on top of the rice. 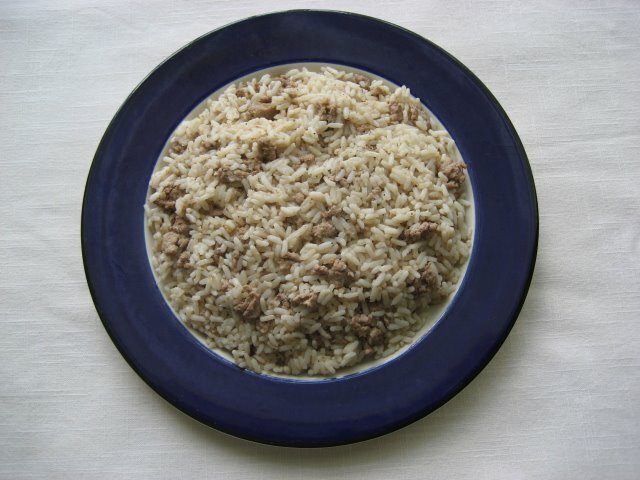 Alternatively, you take a whole suckling lamb and stuff with the rice/nut mixture. When the lamb is cooked (I guess in the oven or on a barbecue), you just put it on a large platter with the stuffing artistically pouring out of the cavity. Thank you for sharing, Ara. We, at The Armenian Kitchen, wish you ALL a Happy Thanksgiving! OH MY!! I am sooo happy - I JUST found your site! I can see that I will be spending much time here going through your recipes and videos. I live in Glendale, CA and regularly shop at 2 or 3 Armenian markets. I am not Armenian and I can not speak, read, or understand it at all! I often buy prepared Armenian treats or buy spices/ingredients with names I do not recognise and then try to 'figure out' how to use them - whenever I ask the customers, the cashiers, or even the store manager/owner for tips, they can not tell me because they are only speaking Armenian! I am SOOO VERY GRATEFUL to have found your site and I THANK YOU for sharing IN ENGLISH some recipes from Armenia!! I'm delighted that you're so happy! I've been to Glendale (& Little Armenia) and understand just what you mean. Also click on "The Pantry" section, which is a yellow box, for some other helpful hints. If you ever have a question, feel free to email me (robyn@thearmeniankitchen.com). In the meantime, Happy Thanksgiving - and Happy Cooking! Wow, Robyn, thanks for posting this! Susan, check out Abril Books on Broadway, just East of the main post office (right up against the 7-Eleven) or Sartarabad Bookstore, in the shopping strip by Sarkis Pastry (Glendale Blvd, just South of Chevy Chase). They have tons of Armenian cookbooks on sale, many of them in English. I particularly recommend Sona Uvezian's "The Cuisine of Armenia" or Alice Antreassian's "Classic Armenian Recipes: Cooking Without Meat". Although these two cookbooks don't have the glossy pictures that others do, the recipes are more "authentically" Armenian. A BIG Thank You!! to both Robyn & Ara for your replies! Robyn - If you hadn't pointed out "The Pantry" section - I would not have noticed it further down the site - THANK YOU for the tip! Wishing you both a happy and safe Thanksgiving holiday! Does Armenian food go better with Pepsi? Can the French really love Armenian frogs? How Much Do You Know About Rice?